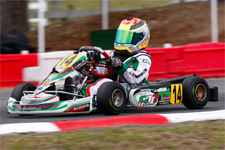 SOLID RUN IN ROTAX MINI MAX FOR ANTHONY GANGI JR.
Anthony Gangi Jr., a member of the GT7 Motorsports kart racing team, continues to develop his Rotax program as the rookie Mini Max driver took on the largest Mini Max field ever assembled. 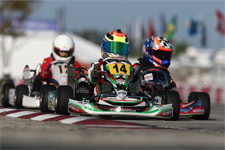 An incredible 54 young drivers took to the permanent parking lot track of the Homestead Karting Complex in a hot and closely contested double-header weekend of Rotax Max racing. Running inside the top ten in most of the timed sessions, Gangi Jr. had to work through mid pack traffic and side-by-side racing to chase down the leaders who ran in close formation at the front. Making passes and dodging contact, Gangi Jr. was able to post solid finishes on both days. "Overall not a bad weekend of racing. As a rookie in the Mini Max class I am really happy that we are running at the front against some of the more experienced drivers," comments Anthony Gangi Sr., GT7 Motorsports Team Principal. "We still have some work to do, but overall our package is very strong. The Tony Kart is working excellent and our engine program is coming along very nicely. I think at this stage we just need to be a bit more consistent." Friday was a solid day of practice and qualifying to setup for the double-header weekend. Gangi Jr. would go second quick in one of the practice sessions to set himself as a frontrunner. In the first round of qualifying, which would set the grid for Sunday racing action, Gangi Jr. would go eighth quickest in the huge field. The second session, which would set the grid for Saturday's racing, saw Gangi Jr. improve to sit sixth after the timed session wrapped up. The South Florida heat continued into Saturday for the first day of wheel-to-wheel action. In the prefinal it was Gangi Jr. getting caught up in a corner one incident and falling back to 36th after the first lap. Anthony Jr. was able to get back to 22nd place in the remaining nine laps as he made a nice charge through the field. In the final Gangi Jr. put on a very solid drive starting from the difficult 11th row and making passes on every lap. Before the flags flew Gangi Jr. was able to get to tenth place for a nice recovery on the day. On Sunday it was Gangi Jr. using his fourth row starting spot to run with the lead group gaining one spot to cross in seventh place. 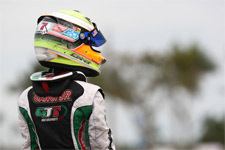 In the final it was another good start for Gangi Jr. who again was right in the mix as he battled throughout the race. 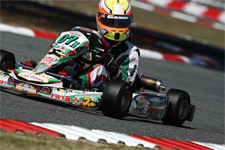 Not able to make the moves he needed as karts went two and three wide every lap, Gangi Jr. slipped back to 12th at the line for another solid result on the weekend. "Not too bad of a weekend. I was able to battle back and did a lot of passing. That was fun. I think we just missed it a bit for Sunday's final race. There were so many guys battling it was hard to pass and not get taken out. 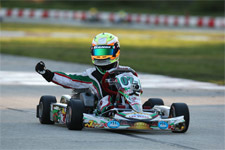 I just wanted to get a good finish," comments Gangi Jr. "The team was great and we have some excellent speed. Chris (Perez), Gary (Willis) and Garett (Grist) did a great job. Ocala is one of my favorite tracks so I am very excited about the next round." Anthony Jr. will return to Florida Winter Tour action in three weeks time as the popular winter racing series heads to north Florida to take on the Ocala Gran Prix facility. The GT7 Motorsports team will hit the track with the Formula Kart weekend up first as Anthony Jr. and Dylan Tavella continue their run in the Vortex TaG Cadet class.